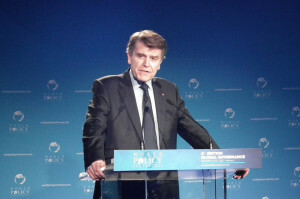 Thierry de Montbrial founded the French Institute for International Relations (Ifri) in 1979. He has been its president since then. He has been professor at the École Polytechnique since 1974 and chaired its Department of Economics between 1974 and 1992. He also holds the chair of Economics and International Relations at the Conservatoire national des arts et métiers since 1995. He has been a columnist at Le Monde since March 2002. He was a columnist at Le Figaro from 1989 to 2001. He is the Chairman of the French-Austrian Center for European Economic Convergence. He serves on the International Advisory Board of Lafarge and on the Board of Directors of Capgemini. In the academic field, he is notably a member of the Advisory Committee of the Peterson Institute for International Economics, IIE, Washington, and of the Carnegie Moscow Center, of the Advisory Council of the Stanford Institute for International Studies, of the editorial advisory board of Foreign Policy, Washington D.C. and of the editorial board of Russia in Global Affairs, Moscow. He is an invited professor at the China Foreign Affairs University, Beijing. Between 1993 and 2001, he was the first Chairman of the Foundation for Strategic Research. In 1973, he was entrusted with the creation of the Policy Planning Staff (Centre d’analyse et de prévision) in the French Ministry of Foreign Affairs. He was its first director from 1973 to 1979. In June 1992, he was elected as a member of the Institut de France (Académie des Sciences morales et politiques) of which he was elected president for the year 2001. He is a founding member of the Académie des technologies. He was elected as a member of many foreign academies. He was the recipient of the Grand Prize of the Geographic Society for 2003. He is a Commandeur of the Légion d’honneur and has been awarded other state orders by the French and several foreign governments (Austria, Belgium, Brazil, Germany, the Netherlands, Poland, Romania). He authored about eighty professional articles and many books (several of them translated in various languages) in economics and international affairs. He has also contributed to various collective works. Thierry de Montbrial was born on March 3, 1943. He is a graduate of the École Polytechnique and the École des Mines, and received a Ph.D. in Economics from the University of California at Berkeley. He is married and he has two children and three grandchildren.